The spiritual leader of the world’s Orthodox Christians has said that Turkey should grant equal rights to minorities in the country. 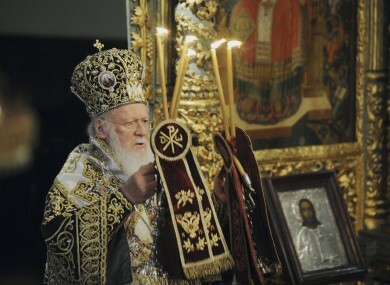 Bartholomew I, the spiritual leader of the world's Orthodox Christians, leading a ceremony in Istanbul last month. THE SPIRITUAL LEADER of the world’s Orthodox Christians said today that Turkey’s new constitution should grant equal rights to minorities in the country and safeguard religious freedoms. Ecumenical Patriarch Bartholomew I met with members of a parliamentary subcommittee seeking an all-party consensus in drawing up a new constitution, which will replace the one ratified in 1982 while Turkey was under military rule. The subcommittee is meeting with non-governmental organisations and representatives of minority groups for input on the drafting of the new laws. Mostly Muslim Turkey, which is seeking to join the European Union, has small Christian and Jewish communities. The EU has made improved rights for the religious groups a condition for membership. Turkey’s existing constitution guarantees religious freedom, but when it comes to minority religions the country has long been criticised for restricting the training of clergy and the ownership of places of worship, and for interfering with the selection of church leaders. It also has recognised Bartholomew I as the leader of the local church in Turkey, but not as ecumenical patriarch of all Orthodox Christians. For decades, Turkey has mostly ignored demands of the Patriarchate, mainly due to mistrust stemming from a rivalry with Greece. However, Prime Minister Recep Tayyip Erdogan’s government has pledged to address the problems of religious minorities and said he hopes the new constitution will correct democratic shortfalls. Bartholomew told reporters he favors a constitution that promotes equal rights and religious freedoms, including the reopening of a Greek Orthodox seminary that trained generations of patriarchs. An 18-page report presented to the subcommittee also makes demands for government funds for minority schools and places of worship, Bartholomew said. Bartholomew, who is based in Istanbul, is the spiritual leader of hundreds of millions of Orthodox Christians worldwide. Email “Turkey urged to allow greater religious freedom”. Feedback on “Turkey urged to allow greater religious freedom”.